Like children’s fairy tales, foreign policy myths are created, told and retold for a purpose. The Boy Who Cried Wolf imparts a life lesson while entertaining your five-year-old niece. Unfortunately foreign policy myths are seldom so benign. The tale told about Romeo Dallaire illustrates the problem. While the former Canadian General rose to prominence after participating in a failed (assuming the purpose was as stated) international military mission, he’s widely considered a great humanitarian. But, the former Senator’s public persona is based on an extremely one-sided media account of his role in the complex tragedy that engulfed Rwanda and Burundi two decades ago. On the other hand, a Canadian newswire search of “Romeo Dallaire Rwanda” elicited over 6,000 articles that generally provide a positive portrayal of Dallaire. Similarly, a search for mention of Dallaire’s 2003 book Shake Hands with the Devil elicited 1,700 articles. The complex interplay of ethnic, class and regional politics, as well as international pressures, which spurred the “Rwandan Genocide” has been decontextualized. Instead of discussing Uganda’s aggression against its much smaller neighbour, the flight of Hutus into Rwanda after the violent 1993 Tutsi coup in Burundi and economic reforms imposed on the country from abroad, the media focuses on a simplistic narrative of vengeful Hutus killing Tutsis. In this media fairy tale, Dallaire plays the great Canadian who attempted to save Africans. While two decades old, the distortion of the Rwandan tragedy continues to have political impacts today. It has given ideological cover to dictator Paul Kagame’s repeated invasions of the Congo and domestic repression. In addition, this foreign policy myth has been used to justify foreign military intervention as is the case with the current political crisis in Burundi. 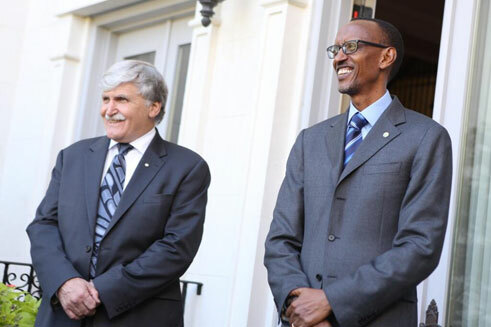 The myth of Dallaire in Rwanda is also cited to rationalize the Responsibility to Protect doctrine, when in fact the true story illustrates the inevitable duplicitousness of foreign interventions.